It's not difficult to appreciate the craft and attention to detail in first time feature director Ari Aster's Hereditary. What is difficult to appreciate is the narrative path Hereditary follows and how much it ultimately feels patched together in order to execute horror tropes that, in all honesty, it is too good for. There is one aspect of Hereditary that feels right at home exploring the continued ramifications and deep-seated issues that are passed from one generation to the next while being more than willing to take on and explore how family can really mess you up given the most extreme of circumstances, but there is another side to the film that wants to utilize this most extreme of family dramas to paint itself definitively into the horror genre and this is where the movie kind of falls apart. The upside to this is that Hereditary only begins to really become or at least fully embrace this unnecessary narrative evolution in the last fifteen to twenty minutes or so. Prior to this, Aster shrouds so much of what is actually going on in this questionable state of what might be happening and what is actually happening by building Toni Collette and her Annie's mental state to a point where her actions are in total question of reality. We're made aware of her family history and their bouts with depression and mental health issues very early while throughout the course of the film Annie experiences incredible and unthinkable traumas that would undoubtedly bring such issues to the forefront, but while the devolving security of Annie's mental state is what ultimately brings about the true, genuine horror in Hereditary it is also this avenue, this idea of how bad parents can mess up their children that is placed on the backburner in favor of the more genre-specific plot elements. It is something of a shame it's with this familiar bang that Hereditary decides to go out as it leaves something of the wrong impression on the audience given the majority of what comes before the final revelation is an unsettling more than it is scary exercise in pacing that boils each individual party to an intentionally uneven place of uncertainty, exhaustion, and just...pure misery. Hereditary is one of those movies that is easier to admire than it is to necessarily enjoy, but it seems Aster only ever meant to paint a portrait rather than entertain a mass. It's not difficult to appreciate the camera, sound design, and especially each of the very committed performances in Hereditary, but that this twisted dysfunctional family drama ends up being more dysfunctional than it does pure family drama leaves a simplicity to be desired. 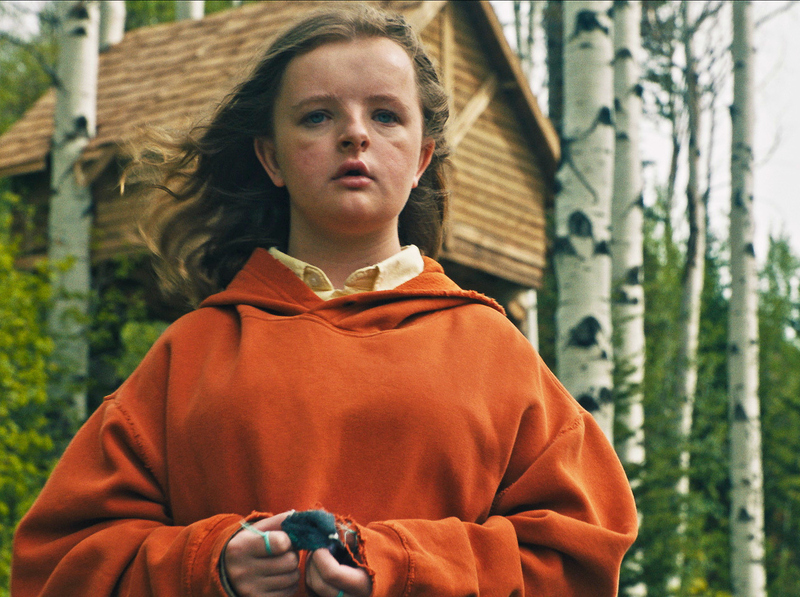 Charlie (Milly Shapiro) is an odd child in Ari Aster's Hereditary. Hereditary is being described as a horror movie with intense elements of drama and that is certainly what it is, but more than anything else this is a movie about the pressures, stresses, and blame that are passed from one family member to the next in search of a place of truth or reason or justification or whatever it might be that an individual party who is living at the time may or may not need in order to exist with the least amount of any of those things. Unfortunately, through the actions of Annie's mother Annie has seemingly felt nothing but fault and guilt for the majority of her life. As stated in the previous paragraph, Annie enlightens both the audience and those fellow members of her grief counseling group very early in the film that her family has a long-standing battle with mental illness and depression as her father starved himself to death while her brother hung himself after stating their mother was forcing people into his head. For these reasons and due to the fact she then saw and felt it necessary to keep her first born, Peter (Alex Wolff), away from her mother Annie inherently feels this deep guilt; this sense of constant stress over whether letting her mother back into her life and the life of her second child, Charlie (Milly Shapiro), and whether or not that was the best choice despite seeming objections from her husband, Steve (Gabriel Byrne). Furthermore, the pressure of having these children that was applied to Annie that is eventually revealed only adds to the stress and guilt she feels when somewhat manifesting these feelings and fears into actions that are despicable and otherwise unexplainable. Hereditary is a movie about how these kinds of unspoken struggles often come to the surface in the ugliest of ways which is naturally intensified by the genre in which Aster has chosen to convey his story. We initially meet Annie and her family shortly after the death of Annie's mother which seems to be more of a period of relief than it is one of grieving-Byrne's Steve and Wolff's Peter are especially disinterested in mourning and more in moving on with their lives-but then there is Shapiro's Charlie who, by all accounts, is a rather odd individual. Charlie is quiet, she likes to draw, and every so often will make a "cluck" noise with her mouth so as to remind you she's present. Charlie also has strange habits of decapitating animals, sleeping outside in her tree house, as well as an unnerving connection with her grandmother-even after the matriarch has passed on. Everyone else in the family seems to ignore these strange traits or are so desensitized to Charlie's choices by now nothing seems out of the ordinary, but it is in the wake of this death in the family that what was thought to be the source of heartache a la evil that tensions only continue to rise rather than disintegrate. 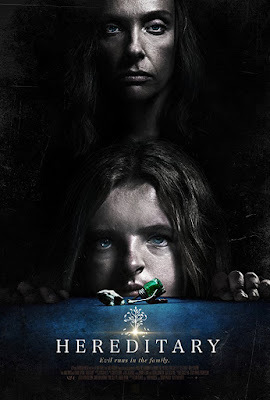 It is then due to Hereditary basking in such rich material through its many themes and ideas that are intricately implemented that it also comes to be disappointing that the film does not feel more cohesive upon first viewing. After having read many other thoughts, theories, and critiques (or lack thereof) of the film it seems a second watch of the film might be extremely beneficial as far as seeing the throughline of how all the dots so precisely connect and while that's great news and something to look forward to (I was immediately intrigued by the thought of if this might be the rare exception where a horror film improves upon multiple watches) it also strikes me as being a caveat that shouldn't technically be necessary to fully appreciate what a great movie the film actually is. Is Hereditary a bad movie? Absolutely not. The craft on display alone is worth the full price of admission, but as far as how the narrative devolves into a rather rote re-imagining of such cult/witch devil-worshipping tribes requiring sacrifices so as to please one of their strangely-named deities it is rather disappointing and honestly, disheartening. It is not that Hereditary uses the horror genre as a way to tell its story-this is done effectively in multiple instances throughout Hereditary-but rather it is how the film takes advantage of the genre and uses it when Aster's imagination seems to otherwise lack a clear direction or idea as to how or where to take the story so as to both be as surprising and fresh. What makes where Hereditary eventually goes so disparaging is that so much of what precedes it feels destined for so much more. In fact, there is a sequence that lasts for a solid ten minutes that occurs near the end of the first act and it is within this scene that Aster brings every single one of his seeming talents together to craft something that is both a technical marvel as well as something literally breathtaking and narratively unsettling. Seriously. The sequence works so well in fact that, as we see what unfurls after these events, we are largely invested so as to better understand what these characters might do in order to cope rather than being interested in these characters for where their particular story arcs might lead. To best take advantage of the stage he sets for himself Aster goes to both complicated and abundantly interesting places as far as the family dynamics are concerned, but it is with the entrance of Ann Dowd's Joan that things become more standard horror movie fare. The best aspect of Hereditary is this chronicling of Annie's descent into insanity despite her best efforts to avoid this very fate. This, coupled with the fact that Peter comes to be as crucial an element as any, despite the marketing pointing the audience to expect as much from Charlie. In this way, Aster plays on the audiences assumptions and upends our expectations in ways that are still fulfilling from a story perspective because of these rich ideas that deal in sacrifice, greed, distrust between those we're told all our lives we should be able to rely on, and sometimes the complete abandonment of those we once loved or still do for the sake of something bigger or what is believed to ultimately be better. Charlie, Annie (Toni Collette), Steve (Gabriel Byrne), and Peter (Alex Wolff) are certainly a peculiar crew. Let us return to Annie's descent into madness though as, for everything else Hereditary weaves into its execution and sometimes throws against the wall, it is Collette's performance and her reaction to the series of escalating of events that is happening around her that will forever be the stand-out feature in the film. There are no less than three separate, but equally impressive sequences in Hereditary where Collette either puts on full display the range she is capable of or plays to a more subtle level than might be expected in the genre, but in doing so garners greater and more affecting results. For instance, there is a blunt moment between Peter and his mother that may have received the biggest gasp from the audience in attendance at my screening none of which had to do with employing any scare tactics. It's in this type of reaction alone there is evidence of where Hereditary finds its most weight as well as the true source of its horror. This sense coming from the fact that we come to realize Annie's descent into madness is actually this burden of her having to carry the weight of her lineage, of having to essentially breed these children for her mother so that they may one day be possessed by a demon. Once upon a time mental illness was considered a possession or as coming from a demonic influence and so there are hints of this type of metaphor at work in Aster's screenplay. This idea is rather deliciously paid off as-if you consider what happens to each of the women in this movie-the grandmother, Annie, and Charlie are all relieved of where their mental illness would have been housed. Relieved of what was causing this pain; lifting a curse if you will. And so, while Hereditary offers the furthest thing from a happy ending one can only hope Annie's mother wasn't lying or that she wasn't only referring to whatever glory might be due to Paimon when she said there will be riches and rewards for she and her families sacrifice if for nothing else, for some kind of consolation for Annie. It truly is tragic when one takes a moment to step back and look at it from the point of view that having children with someone you love should be this joyous and life-altering experience, but this was never going to be the case for Annie; the blessing of being able to have children was always going to be a curse. This is another way in which Aster upends the expectations of the audience as-despite the stress, guilt, and levels of denial that Annie faces-she still tends to feel more like an anti-protagonist, if you will. Annie is very clearly not the antagonist-that belongs to an amalgamation of her mother and this demon seeking a host body-but there is this strong hesitance to embrace the character. She is someone who, because she feels blamed and is in so much denial and constantly experiencing so much guilt that it's difficult not to look at her as the only one who can actually do something to turn her life around. Even her husband seems to view things this way as Steve largely represents the viewer in the scenario. This brings us to the other characters in the film. Through Annie we sense a coldness in the relationships she holds with each of them. This is true of especially Peter and Steve. With Charlie, and Shapiro is devastating as the misunderstood and forever mysterious Charlie, there is more a sense of longing than anything else. It is with Charlie that it's as if Annie sees the real possibilities of what could have been whereas with Peter there is this embodiment of regret-of where she first began to lose control of her life and of her destiny. The film was always, in part, focused on Peter though, as even with the opening shot the first room we are welcomed into is that of Peter's. Wolff's character again is used in a way where Aster reverses the expectations set by the marketing and by most films of the genre by initially giving the impression Peter is something of a throwaway character who is unfocused and out of touch. It is through Peter that the film actually infuses some moments of real, honest familial humor in the dynamic and the way we interact with those we know best. This too is a way to distract from how real what is going on around Peter truly is. 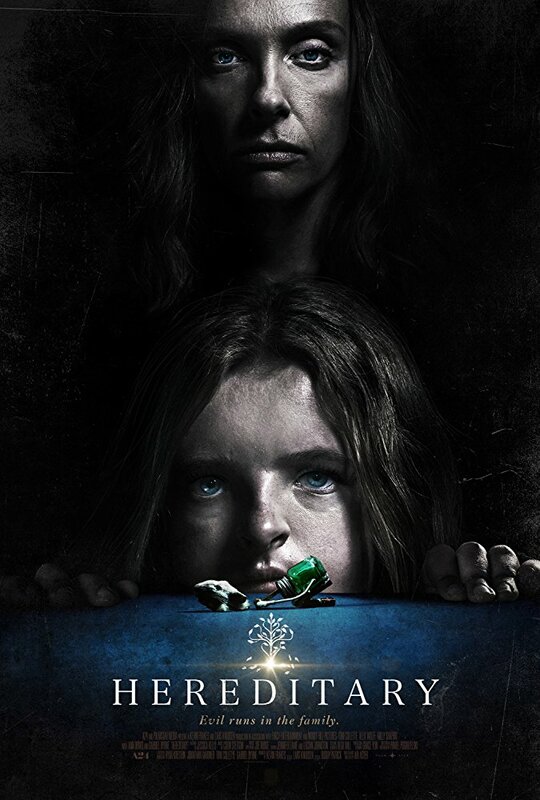 Wolff balances his characters multiple roles within the narrative arc perfectly for as soon as Peter gets thrown into the thick of Hereditary Wolff really shows up; going from a disinterested attitude disgusted with his mother and buddy-buddy with his dad to someone being corrupted and tortured. Wolff's performance eventually personifying these emotions in the most terrifying of expressions ultimately featuring an image of Wolff where his face is disfigured, but not from any physical beating- that will forever stick with me. And thus the inner-conflict of the character drama versus the horror execution continues. One is rich in its characters and dissension while the other largely feels a way to streamline the madness. 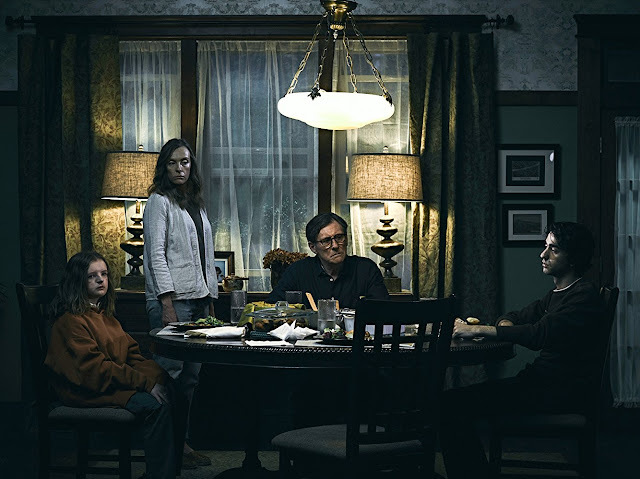 Much like Annie's dollhouses, the horror elements of Hereditary create this feeling of being played with, but also lend Aster and in turn Alice a way to more easily feel in control. The way Annie uses the dollhouses suggests her disconnection to her family due to that trauma she has experienced, but the way Aster uses the genre tropes suggests a disconnection from the material and the characters that doesn't always feel natural.